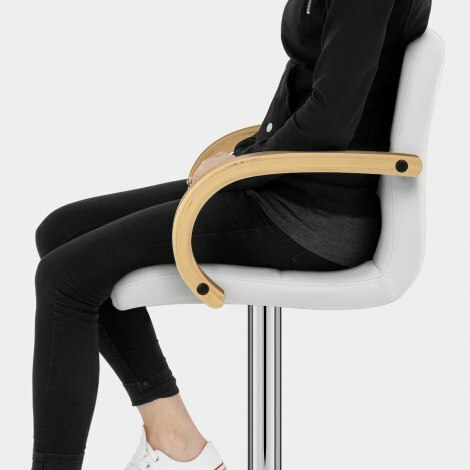 Fusing first class fashion with ergonomic design, the Burton Oak Bar Stool White is not to be missed. Lending a clean and crisp appearance to the kitchen or breakfast bar, the Burton Oak Bar Stool has unprecedented style and fantastic levels of relaxation. Modern and minimalist, the crisp white faux leather with panelled detailing invites you to sit back and relax, whilst curved oak finished bentwood arms provide additional support. 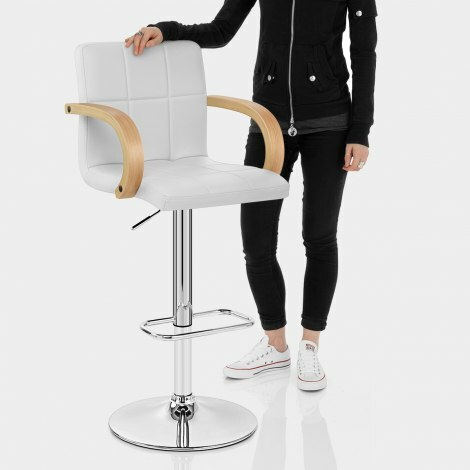 The cushioned seat and high backrest deliver superb comfort, meanwhile the 360 degree swivel and gas lift mechanism allow you to tailor the stool to suit your needs. Built on a mirrored chrome frame, a rectangular footrest is handcrafted for a useful perching spot for the feet. Completed by a protective ring on the underside of the base, the Burton can be used in a whole host of interior settings. "Good quality bar stools at a very reasonable price"
Very pleased with stools and price + great delivery service. I ordered 4 of these and they look just like the pics. Easy to put together. They look very stylish. Too early to comment on durability but seem to be well made and comfortable. Would recommend. Good quality bar stools at a very reasonable price. Easy to assemble and very quick delivery. Bar stools were excellent good quality and comfortable delivery very quick.